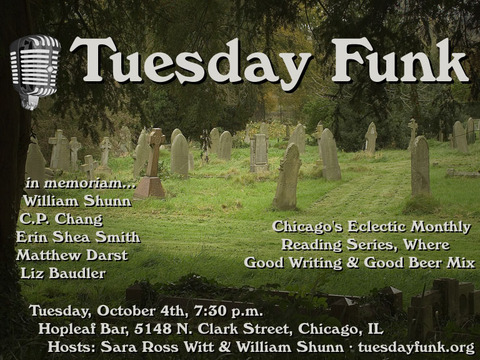 Be sure to join us next week on Tuesday, October 4, 7:30 pm, upstairs at Hopleaf, for five more great readers, including William Shunn, C.P. Chang, Erin J. Shea, Matt Darst, and Liz Baudler. Hey, if you weren't at Hopleaf this week for Tuesday Funk, you missed a good 'un, a real good 'un. 12-point buck good, in fact. We had Carissa DiGiovanni reading us poems, Noreen Natale telling us amusing stories, and Naomi Buck Palagi on a return visit to read us more poems. 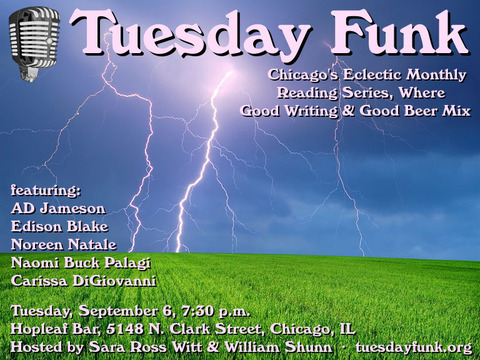 After a break for beer and a downer of a 9/11 poem from co-host William Shunn, we had a rip-snorter of an excerpt from Edison A. Blake's recent novel, and a wild selection of prose from A D Jameson (not to mention plenty of audible gasps from the audience). And the elk? The elk was present only in our hearts. In fine, it was a spirited and challenging kickoff to our fall season, which will continue on October 4th with the work of Erin Shea Smith, Liz Baudler, CP Chang, zombie fiction by Matthew Darst, and a sci-fi baseball story from William Shunn. It's a veritable Oktoberfest of good stuff, so next time take careful aim because you won't want to miss your shot. Reminder: Tuesday Funk #37 is tonight! Hey, do you smell that? No, not that! The good smell, I mean. It's ... could it be? ... I think that's the crackling smell of raw talent,, and I'm pretty sure it's heading for Tuesday Funk, the monthly Chicago reading series where good writing and good beer mix. This evening, in honor of our 37th big episode, we're bringing you five prime readers for no more than the price of a single ice-cold beer. Our electric lineup tonight includes AD Jameson, Edison Blake, Noreen Natale, Naomi Buck Palagi, and Carissa DiGiovanni, none of whom you'll want to miss. We'll also throw in one of our patented Poems By Bill for no extra charge. So "like" us today on Facebook, grab a beer from the bar, and we'll all get blown away tonight at Hopleaf. Video: Karen Skalitzky gets "Out"
And be sure to join us tomorrow night, Tuesday, September 6, 7:30 pm, upstairs at Hopleaf, for five more great readers, including AD Jameson, Edison Blake, Noreen Natale, Naomi Buck Palagi, and Carissa DiGiovanni! 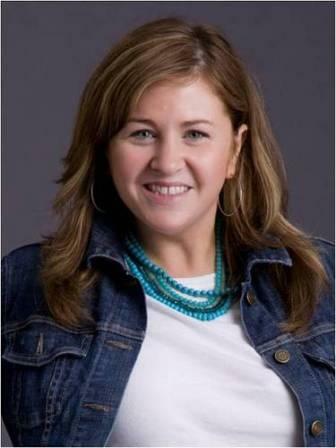 Carissa DiGiovanni is a third-generation Chicagoan who works in the non-profit sector. 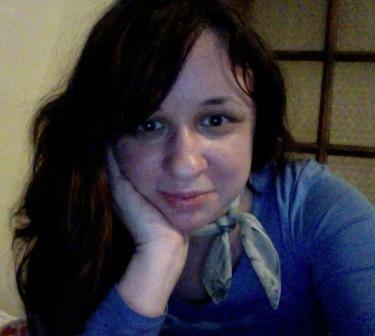 Her work has appeared in Sierra Nevada College Review, Journal of Experimental Fiction, SLAB, and Muslim, Wake Up! She graduated from the MFA program in Creative Writing at Indiana University, Bloomington. Currently, she is working on a chapbook. 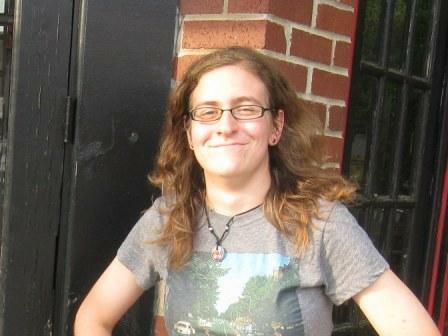 Join us Tuesday, September 6, 7:30 p.m., at Hopleaf's upstairs bar to hear Carissa and all of our talented readers! A D Jameson is the author of two books: the prose collection Amazing Adult Fantasy (Mutable Sound, 2011), in which he tries to come to terms with having been raised on '80s pop culture, and the novel Giant Slugs (Lawrence and Gibson, 2011), an absurdist retelling of the Epic of Gilgamesh. He has taught classes at the School of the Art Institute of Chicago, Lake Forest College, DePaul University, Facets Multimedia, and StoryStudio Chicago. He is also the nonfiction / reviews editor of the online journal Requited. This fall, he became a PhD candidate at the University of Illinois at Chicago. In his spare time, he contributes to the group blog Big Other. Join us Tuesday, September 6, 7:30 p.m., at Hopleaf's upstairs bar to hear AD and all of our talented readers!